Loveyatri (transl. Love travellers; Hindi pronunciation: [ləʋjaːt̪ɾɪ]) is a 2018 Bollywood musical romantic drama film produced by Salman Khan under Salman Khan Films and directed by debutante Abhiraj Minawala. It is inspired from the Telugu film Devadasu. It stars Aayush Sharma and Warina Hussain in its lead roles, and was released on 5 October 2018. The story starts with Sushrut's aka Susu's (Aayush Sharma) teacher, who refunds his tuition fee to his parents as he thinks Sushrut is completely unambitious. His father is always tired of asking him to plan his future but he is stuck with his dream of opening a Garba academy. The story then shifts to London where Michelle (Warina Hussain) is a very bright college student. Her father, Sameer/Sam (Ronit Roy) owns a chain of laundry there. Their relatives fool them by faking Natthu's (Manoj Joshi) heart attack as they want them to come to Baroda. Terrified, they reach India and find out the truth. On everybody's insistence, they plan to stay there for 9 days until the festival of Navaratri. At Garba, Sushrut sees and falls in love with Michelle at first sight. His best friends dig out her information from her relative Khusboo. With his Garba singer and clothing store owner uncle Rasik's (Ram Kapoor) advice he plans to charm Michelle. As per plan while performing Garba, Susu stays around Michelle and she accidentally hits dandiya on his eye. He fakes an injury. She calls him to apologize. Sushrut acts as if he was deeply injured. He spends time with Michelle and they become good friends. Khushboo sees them together and says to Susu that she will reveal the truth to Michelle. Susu is terrified and reveals the truth himself to Michelle. Michelle says she already understood that the injury was fake as he goofed up and bandaged the incorrect side of his forehead. Also, he kept the bandage just for a day then forgot to put it. Michelle takes him to her mother's NGO, which provided women employment. It had shut down after her death when Michelle was 10 years old. Earlier, when Michelle was 4 years old, Sam went to London to earn money to support her mother's dreams but could not come back due to his business and immigration issues. Her mother died waiting for her dad. Michelle reveals her dream of reopening the NGO. She also reveals her actual name Manisha which was changed by Sam after she moved to London post her mom's death. Sushrut decides he will call her by the name Manisha. Soon, Sam gets to know about Michelle and Sushrut from Khushboo. He calls Sushrut on a Ferris wheel and says that there is a difference between them, similar to the top and bottom of the wheel. He asks him to stay away from Michelle as there is a huge difference between their status and class. He also lies, that she is in a relationship with Chris. Michelle receives an email that she got admission to London's top business school. She is very happy and throws a pizza party for Sushrut and his friends. Out of happiness, she informs the pay package of the college (after graduating) is 85000 pounds (75 lakhs INR). Sushrut assumes she is showing off and also cheating on him with Chris. He insults her badly at the restaurant. She does not respond and goes away from the restaurant. Later Sushrut's friends' inform to Rasik about the incident. On Rasik's insistence, Sushrut realizes his mistake and wants to apologize. When Michelle is going back to London, Sushrut and his friends try to reach the Ahmadabad airport from Baroda to stop her but their activa meets an accident on the way and they are unable to reach. 10 months pass by. Sushrut still remembers Michelle and tries for ways to go to London. Finally, he gets an opportunity when Rasik's Garba troop gets a contract to perform in London. He pleases the officer by doing garba in his visa interview and gets the visa and reaches London. While searching for Michelle, he remembers and goes to 'Shelter Home' where Michelle volunteers every Sunday. He meets her and apologizes. Michelle shares her number and promises to meet him. The next day he hangs out with Michelle and her friends and meets Chris, and assumes him to be her boyfriend. He gets jealous and feels bad when Michelle speaks to Chris. Heart broken he goes to a pub where Rasik motivates him by telling him Indians learn about love from movies. He tells him about Yash Chopra, Sooraj Barjatya, Aamir Khan (Qayamat Se Qayamat Tak), Shahrukh Khan (Veer-Zaara), Salman Khan (Tere Naam) and asks to declare his love to Michelle. The next day he sees London with Michelle and her friends and is spotted by Sam. Then on the Tower Bridge (London Bridge), Sushrut expresses his love and speaks to her about Chris assuming him to be her boyfriend. He calls his friends and comes to know that Negative and Kushboo have become a couple. They also motivate him to speak to Michelle again as Michelle had never told him about Chris directly. Sam meets Sushrut again and reminds about the status gap between them by showing him the Ferris wheel London Eye. Shushrut realizes that Sam had brainwashed him about Chris and confronts him. In order to frame Sushrut, Sam breaks his own car's window and puts Sushrut's hand on his collar. Police come and arrests Sushrut. Gujrati Police officers Jignesh (Sohail Khan) and Bhavesh (Arbaaz khan) sets him free after hearing his story while everybody is searching for Sushrut. Michelle meets Rasik and finally gets to know, that Sam lied to Sushrut about Chris. She confronts Sam about it and about her love and NGO dreams. She tells Sam that he has always imposed his choices on her but she wants to be with Sushrut She runs down where Shushrut is waiting with Rasik and Garba party. She informs Sushrut that Chris is gay and not her boyfriend. Sam finally had to agree for their marriage when Jignesh and Bhavesh threatened him that they have the CCTV recording of him breaking the car windows and they will arrest him if he does not agree for the marriage. At the end, they return to India and Michelle fulfills her dream to reopen her mother's NGO and Sushrut opens his own Garba academy. The last statement states they lived happily ever after. Salman Khan announced the film in 2017. He also confirmed via Twitter that the film would star his brother-in-law Aayush Sharma and would be directed by Abhiraj Minawala. Abhiraj was Ali Abbas Zafar's assistant director for Sultan and Tiger Zinda Hai. In February 2018, Salman announced that Warina Hussain would be the leading lady of the film. The film is the Bollywood debut for both Aayush and Warina. 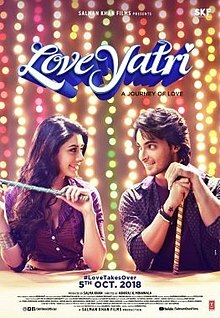 Loveyatri is a romantic drama set against the backdrop of Navratri in Gujarat. Aayush stars as a garba teacher from Baroda, who falls in love with an NRI, played by Warina, when she visits the town during the festival. The film was shot in two schedules. Several scenes were also shot in Vadodara in March 2018. This was followed by the second half starting in April 2018 in London. Principal photography completed in June 2018. Tanishk Bagchi, Lijo George - DJ Chetas and JAM8 composed the soundtrack of the film while the lyrics are penned by Shabbir Ahmed, Manoj Muntashir, Darshan Raval, Tanishk Bagchi, Badshah, Niren Bhatt, Yo Yo Honey Singh and Hommie Dilliwala. The soundtrack of the film was released on 3 October 2018 by T-Series. The film's first teaser was released on 14 June 2018, narrated by Salman Khan. The trailer was unveiled on 6 August 2018. The film was promoted in Lucknow and Patna. A minor dispute emerged during the middle of promotions, in late September 2018, regarding the film's name. It was originally titled Loveratri, which is a play on the words "love" and "Navratri" (a religious celebration of the Hindu goddess Amba). However, the religious organisation Vishva Hindu Parishad felt that the title distorted the meaning of the festival and filed a complaint against the producers. A court in Bihar asked the police to file a First Information Report against the actor Salman Khan and the rest of the film's cast. On 18 September 2018, Khan announced on his Instagram page that the film's title would be changed from Loveratri to Loveyatri, with "yatri" meaning "traveller", thus changing the overall meaning approximately to "the journey of love". However, the following day a Gujarat-based Hindu organization, Sanatan Foundation, legally filed a Public Interest Litigation move against the new name, claiming that it still sounded too similar to "Navratri". They sought another name change (possibly to "Love Ki Yatra"), changing the film's content, or to ban the film entirely for "hurting the sentiments of Hindus". On 27 September 2018, the Supreme Court ruled in favor of the film's producers, stating that "no coercive action is to be taken in any part of the country against Salman Khan Ventures Pvt ltd."  The ruling was submitted considering the film's status as having been cleared by the Central Board of Film Certification (CBFC), and yet had an FIR registered in Bihar against it and a criminal complaint pending in Vadodara, Gujarat. The statement concluded by asserting that any further complaints, particularly those related to the contents or name of the film, would not be entertained. ^ "Loveyatri | British Board of Film Classification". www.bbfc.co.uk. Retrieved 4 October 2018. ^ "Loveyatri - Movie - Box Office India". Box Office India. Retrieved 15 October 2018. ^ "LoveYatri Box Office Collection till Now - Bollywood Hungama". Bollywood Hungama. Retrieved 6 December 2018. ^ "Salman Khan's all set to launch Aayush Sharma in the film Loveratri". filmfare.com. Retrieved 12 October 2018. ^ "Salman Khan introduces Loveratri's female lead Warina Hussain". 7 February 2018. ^ "Loveyatri Preview: Aayush Sharma And Warina Hussain Are All Set To Make You Fall In Love". NDTV.com. ^ "Loveratri: Aayush Sharma with family and Warina Hussain return from London". PINKVILLA. Retrieved 12 October 2018. ^ "Loveyatri - Original Motion Picture Soundtrack". Saavn. ^ "'Loveratri' Trailer Launched And Has Crossed Whooping 1 Billion Views". Headlines Today. Retrieved 16 August 2018. ^ "'Loveratri' pair Aayush Sharma and Warina Hussain visit Heritage sites in Patna". ^ "Salman Khan's next production venture Loveratri is LoveYatri now". indianexpress.com. 19 September 2018. Retrieved 7 October 2018. ^ "Salman Khan Changes Warina Hussain And Aayush Sharma's Loveratri Title. It's Loveyatri Now". ndtv.com. Retrieved 7 October 2018. ^ "Loveyatri is unacceptable, says Hindu outfit". indianexpress.com. 19 September 2018. Retrieved 7 October 2018. ^ "No Coercive Action Against "Loveyatri" Producer Salman Khan: Top Court". ndtv.com. Retrieved 7 October 2018. ^ "SC stays FIR against makers of LoveYatri after Salman Khan moves court, alleging threats from Hindu outfits- Entertainment News, Firstpost". firstpost.com. Retrieved 7 October 2018.